It's holiday season and it's very easy to stop exercising at this time of year. 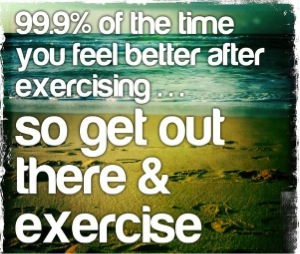 Either because it's too hot (it's never too hot to exercise) or because "I'm on holiday". It's also felt like I've been away on business quite a lot recently which could make things more difficult to squeeze in a workout. My view though is there is always a way to fit in a workout. A combination of a little bit of preparation and some common sense and you can fit in a workout almost anywhere you are in the world. I have a philosophy which is now second nature to me. I always know the opportunities in my week that I have to exercise. I know which days I can run, which days I won't be able to get out so I'll have to do an online or DVD workout. I'm not obsessive about it but by planning I can foresee days when it's going to be tougher to fit in a workout. For example, this week, I know that Tuesday and Wednesday are going to be virtually impossible to fit in so my plan is to exercise before work on Tuesday morning and I'm going to be determined that it happens, that way I know I've not missed out on my exercise for two days straight. The same goes with travel. If you know that your travelling days are going to be too difficult, can you plan around them? That said, on arriving at your destination whether that is after a long flight or a long drive, exercise can be a great thing. Perhaps keep it light but after being sat in one place for hours, is there a better time for yoga? When I'm on business, I normally have a laptop with me and so often carry a yoga DVD. I like Jillian Michaels which is a blend of yoga and gentle cardio. I have Yoga Meltdown and Yoga Inferno, both of which can be done with bare feet limiting the amount of equipment you need to take with you. I was staying at an Airbnb place recently though and took along my yoga DVDs as normal to get there and find, no DVD player and, as I wasn't on business, no laptop to play it on either. Frustrating. But come on, no excuses! So I used my Kindle and found a Fitness blender Barre routine which is another great routine to do with no trainers on and also helps to stretch out muscles after a long journey. Trainers can be weighty but it's worth thinking about packing them, certainly if you're away for a while. Running is a great way to get to know a place and I recently went away without them, thinking "I'm only away for 3 nights" to see other runners and feel really miffed I'd not done so. I'm going away soon for 6 nights and I'm going to find a way. There is also great mapping software nowadays for mapping out running routes. If I have time in a new destination I try and map out a proposed running route before I go. If you're travelling in the UK, www.streetmap.co.uk is a great way to find footpaths and bridleways in unfamiliar places, otherwise I stick to street running. I do love running along promenades by the sea though and it is one of my favourite things to do when I'm by the UK coast. There's often a breeze too to help keep you cooler in the summer. And last but definitely not least, especially in the UK there are Parkruns EVERYWHERE! If you're away on a Saturday morning, why not be a tourist to a new Parkrun? So I hope I've given you a few ideas to help keep the exercise going even when you're away. I know so many people who complain they put on weight when they travel for business because the food portions tend to be larger and less healthy and they can't get to the gym. Also people say they don't bother with exercise "because I'm on holiday" but that's only really an excuse if you think of exercise as some kind of punishment. I find when I don't exercise nowadays I don't sleep as well, I am irritable and have less energy. Why would I want to feel like that when I'm away? It's been hard to stay in shape since I quit playing Ice Hockey. Thanks for the encouragement. My view is always doing something is better than nothing. Hope you can find something you love to do.